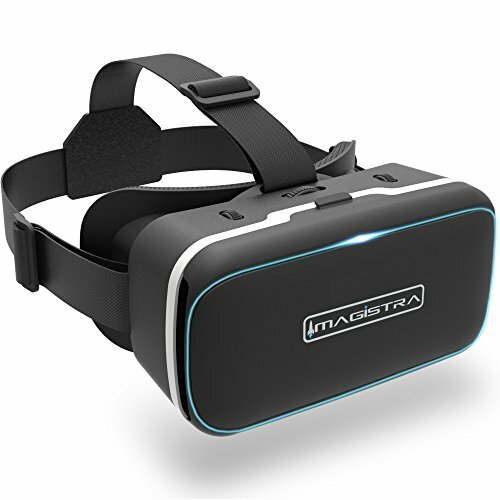 Transform your smartphone into an affordable virtual reality system with the Imagistra VR Headset. Simply insert a compatible smartphone and be whisked away into unforgettable 360° worlds from the comfort of your home. Ride thrilling roller coasters, fight zombies, go skydiving, explore haunted houses, or immerse yourself in a 3-D video. Sight-Saving Optics - Our blue light blocking anti-glare lenses incorporate aspheric optics to maximize clarity and enhance your field of view. Excessive blue light exposure has been linked to disrupted sleep schedules, eye fatigue, and increased risk of eye disease. Action Button - Eliminate the need for a remote and expand your access to a wider range of content with our multi-function action button, allowing you to play games and interact with app and video menus. 100% Satisfaction Guarantee! Our VR glasses are backed by our manufacturer money back guarantee with 1 year free replacement warranty. Don’t miss out on experiencing the wonder of virtual reality. Add to cart today! ENTERTAINMENT FOR ALL AGES - Explore the ever-evolving world of virtual reality. Watch videos, play games, go on virtual tours, and try new adventures with our cutting-edge technology powered by your own device. ENHANCED CLARITY REDUCES EYE FATIGUE - Enjoy a longer virtual reality experience, while keeping your eyes healthy, with our blue light blocking, anti-glare lenses. Dual adjustable focus and pupillary distance accommodate up to 6 diopters of nearsightedness. HIGHLY COMPATIBLE - Conveniently versatile smartphone holder fits Apple or Android smartphones like iPhone X / 8 / 8 Plus / 7 / 7 Plus / 6 / 6 Plus/ 6s / Samsung Galaxy S5 / S6 / S7 / S8 / Note 4 / Note 5 / Edge, Google Pixel, LG, Huawei, HTC, Nexus, SONY, and more; Suitable for 4.7-6 inch screen smartphones. If you have any questions about this product by Imagistra, contact us by completing and submitting the form below. If you are looking for a specif part number, please include it with your message.